Universal Orlando. Used with permission. If you will be heading to Universal Orlando, you'll find that helping the Transformers save the universe, flying around with Harry Potter and his pals, and getting derailed alongside Homer Simpson on Krusty the Clown's absurdly dangerous roller coaster will make you hungry. But with all of the dining options available throughout the resort, where should you eat? You've come to the right place. I've compiled a list of the top ten best table service restaurants at Universal's two theme parks, its on-property hotels, and its CityWalk entertainment, shopping, and dining district. This isn't just a random rundown based on my personal whims. I had some help pulling the list together from an esteemed panel of expert judges. You can see which travel and food writers participated in the survey that led to the rankings at the Best Universal Orlando Dining feature. To find more reasonably priced restaurants at the resort, see my rundown of Universal Orlando's top ten best quick service restaurants. To cap off your meals or for inter-meal nibbling, check out the 10 best Universal Orlando snacks and desserts. Note that the restaurants can get quite busy, particularly at dinner, and that an advance reservation is recommended in most cases. Reservation info is included for each entry. Before we get to the countdown on the following pages, it's important to note that two new restaurants, both located at CityWalk, opened after I conducted the survey. Both have been getting rave reviews, and I suspect that one, if not both, would displace other Universal Orlando restaurants on the 10-best restaurant list. One is Vivo Italian Kitchen. I got to sample some of the dishes at a press event held just before the eatery opened, and I was quite impressed. The ingredients were fresh (including pasta prepared on the premises), the aromas were intoxicating, and the flavors were delizioso. With entrees such as homemade gnocchi and squid ink seafood, this is no garden variety, touristy Italian restaurant. Surprisingly, however, the prices are reasonable with main courses averaging about $14 to $17. 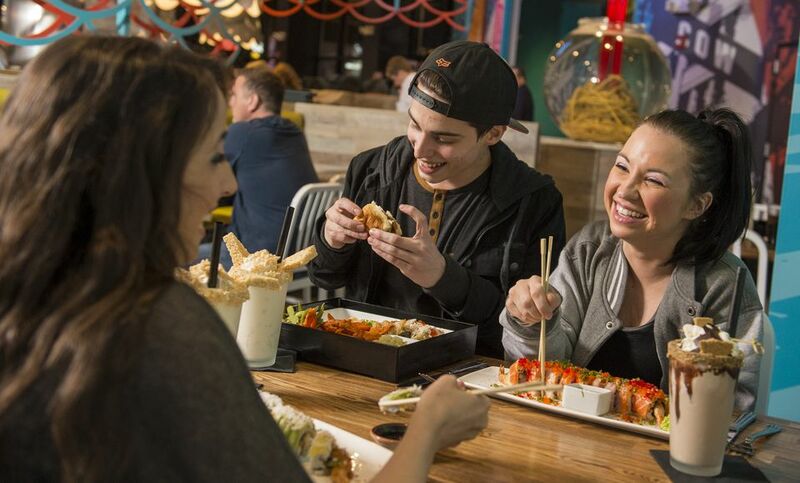 The other new CityWalk eatery is The Cowfish. The concept, combining burgers and sushi, seems a bit odd to me. But patrons have been loving it. The menu includes the usual burger suspects as well as some odd takes such as an apple, berry and brie turkey burger. And the sushi side of the menu includes standbys such as California rolls. But the culture clash can get mighty strange with mashup offerings like "The High Class Hillbilly," described as "Southern-style Bar-B-Q-Shi." It's a potato-wrapped sushi roil filled with pulled pork and BBQ sauce that is flash fried and smothered in bacon coleslaw. Purists may roll their eyes at this and other bizarre fusion offerings, while adventurous diners may reach for the soy sauce and ketchup and go for it. You know Emeril, the flamboyant celebrity chef who loves shouting, "Bam!" as he tosses ingredients into his flaming pans. He has a number of restaurants around the country (including a second location at CityWalk in Universal Orlando that also makes the top-10 list), each with its own menu and personality. Tchoup Chop, named in honor of Tchoupitoulas Street, the New Orleans address of Emeril's flagship establishment, mixes Asian and Polynesian flavors with a dash of Big Easy attitude and spice. The pan-Asian focus befits the restaurant's location at Universal's Royal Pacific Resort. In addition to creative entrees such as hibachi steak and Hawaiian-style snapper, the menu includes an extensive array of pupu appetizers, Japanese grilled robata dishes, and sushi. Erik and Racheal Yates, editors of BehindtheThrills.com and dining survey panel members, ranked Emeril's Tchoup Chop at the head of their list. "The atmosphere and menu are top notch. The service is always amazing, and the staff goes out of its way to make sure you have a great experience," they say. "Its unique menu is the opposite of what you'd expect from a big name like Emeril at a theme park." Attire: Resort casual but you wouldn't feel out of place dressing up at this fine dining establishment. Tucked away in a remote spot in the (relatively) quiet Portofino Bay Hotel, the unassuming Bice Ristorante may not look like much from the outside. But don't judge this restaurant by its facade. With locations around the world, Bice is known for its gourmet Italian cuisine. The Universal Orlando outpost lives up to its reputation. Don't go to Bice expecting a family-friendly, neighborhood Italian restaurant. (That description is more apt for Mama Della's, which also makes the top-10 list.) This is more of a special occasion dining experience -- with prices to match. A la carte offerings include appetizers, salads, and pasta as well as secondi piatti (main course) dishes. To get a sense of Bice, consider some of its mouth-watering choices such as braised veal shank Osso Buco with saffron risotto or roasted maple leaf boneless duck breast served with an apple and fontina cheese soufflé topped with a honey brandy truffle oil glaze. Survey participant Lyn Dowling, food critic and feature writer for Florida Today, especially likes Bice's fresh pasta and says that the Italian restaurant is among the best in the Orlando region, let alone at the theme park resort. One of the first restaurants at the resort, Lombard's is located in the San Francisco area of the original studio's park and is meant to be an oceanside eatery at the city's famous Fishermans Wharf. The prices are quite reasonable, and the food is decent. In addition to seafood (with an emphasis on fried fare), the menu includes pasta, sandwiches, and salads. The "oceanside" location affords great views of the park's nighttime lagoon show, Universal's Cinematic Spectacular. The restaurant offers a fixed-price dining and show package that includes a three-course dinner. A dessert buffet is served on the eatery's deck prior to the show. Reservations are required for the special package. If you are searchin' for your "lost shaker of salt," you can find it, along with cheeseburgers in paradise and, of course, plenty of margaritas, to get you wasted away at the famed singer's restaurant. As with his other eateries, pub grub is featured with a nod to tropical fare such as coconut shrimp and fish tacos. The decidedly Parrothead (that's what Buffet's fans call themselves) atmosphere makes for a fun meal and/or place to catch a drink (or two or… seven). There's live music inside, a singer on the outdoor "Porch of Indecision," and a volcano that occasionally erupts (and spews margaritas!) while Buffet's "Volcano" plays. Across from the main restaurant, the Lone Palm Airport, complete with one of Buffet's actual seaplanes, offers another place to nosh on lighter fare and get wasted away. According to Dan Hatfield, owner, and editor of OrlandoInformer.com and another best Universal restaurant panelist, "Nothing says 'I've made it to my Universal Orlando vacation' like stepping into Margaritaville and hearing the famous line, 'I think we've made it to Margaritaville' played over the speakers." He also thinks it offers good value. Attire: Resort casual, but you wouldn't feel out of place dressing up at this fine dining establishment. The reliable chain serves its old-school steakhouse menu at Universal Orlando with the same kind of attention to detail -- and eye-popping prices -- as its many other locations. Like Morton's, Ruth's Chris, and other high-end chophouses, The Palm isn't shy about charging handsomely for its exquisitely prepared meals. And none of the mouth-watering cuts of meat come with any side dishes; those will cost you extra. Heck, even the sauces for the steaks and chops will cost you extra. In addition to the grilled meat standbys, the menu also offers a few seafood (great for surf 'n' turf combinations) and Italian dishes. If you crave a delicious, classic meal, and money isn't of great concern (hey, you're on vacation, right? ), The Palm delivers. The original studio's park other table-service location, Finnegan's, is a welcoming place. Located in the New York section, the Irish pub appears to be ready for its close-up. The bar area, especially, nails the look and feel of an authentic, lived-in neighborhood gathering spot. As you might expect, you can order corned beef and cabbage, shepherd's pie, fish 'n' chips, and bangers and mash, among other Irish comfort food. Of course, you can wash down the traditional dishes with pints of Guinness, Irish coffee, and other appropriate beverages. There are a few tasty non-alcoholic drinks as well, including a particularly refreshing coconut pineapple slush. You don't need a pot o' gold to dine here; the prices won't bust your travel budget. On especially hot, muggy days spent trudging around the park and waiting in long lines, you'll appreciate the respite of a table service meal in the air-conditioned restaurant. Matt Roseboom, the editor of Orlando Attractions Magazine and a restaurant panelist, picked Finnegan's as his top Universal dining spot. "It’s a relaxing place with live music and great food," he says. Food: Would you believe Mexican? One of the newer restaurants at Universal Orlando, Antojitos resonated with our panel of judges and vaulted to one of the top spots in our top-10 countdown despite being open only a few months in 2014 when the survey was conducted. The brightly colored, eye-catching facade at CityWalk district draws guests to the dining establishment. Antojitos' two floors each feature a different menu, with the second story offering a smaller, but more refined (and more pricey) selection of dishes, while the first floor has a broader variety of dishes at slightly lower price points. Enchiladas, tacos, and fajitas with various fillings are all available on the lower level along with specialty entrees such as Carnitas Lupita, a chile-braised pork shoulder, and Chile Relleno De La Abuelita, a fried poblano chile filed with menonita cheese. Upstairs, more ambitious entrees are featured in place of the usual Tex-Mex fare. Selections include red chile Mahi prepared with pineapple salsa and black bean puree and braised short ribs served in ancho chile broth and manchego corn pudding. Supporting the "authentic" attribute included in the restaurant's name, Erik and Racheal Yates, editors of BehindtheThrills.com, say that Antojitos is not your typical Mexican eatery, while Matt Roseboom, editor of Orlando Attractions Magazine, praises the guacamole prepared table-side as well as the live music. Attire: Theme park casual, but you wouldn't feel out of place dressing up at this fine dining establishment. This is Mr. Lagasse's other Universal Orlando restaurant, which is based on his original New Orleans location and showcases the city's Creole flavors. Unlike the more traditional Pat O'Brien's, another CityWalk dining spot with New Orleans origins, Emeril's kicks it up a notch with entrees such as maple roasted garlic glazed chicken with stewed andouille and seared snapper with grapefruit and jalapeño vinaigrette. Along with Bice and The Palm (and to a lesser extent, Tchoup Chop), Emeril's is a special occasion restaurant and offers an opportunity to have an elegant, leisurely meal while visiting Universal Orlando. Similar to her praise for Bice, Lyn Dowling, food critic and feature writer for Florida Today, says that Emeril's is among the best restaurants in all of Orlando. She ranks it as the resort's top table-service restaurant. Mama Della's probably isn't as cheap as your favorite Italian restaurant back home, but it's a heck of a lot cheaper than Bice, and its relaxed vibe is probably more in sync with your go-to pasta joint. Menus choices include staples such as lasagna and fettuccine alfredo as well as more adventurous dishes such as braised lamb with eggplant caponata and arugula. The portions are ample. The Mama Della who may greet you in the dining room is actually an actress playing the role and not an actual restaurateur (remember this is a theme park resort, so don't take everything you see at face value). The roving musicians, however, can actually serenade you with Italian tunes while you dine. Seth Kubersky, travel and attractions journalist for Orlando Weekly and The Unofficial Guide, chose Mama Della's as Universal Orlando's best table-service restaurant and says that it is "authentic old-school Italian home cooking crafted with top-quality ingredients, delivered by an impeccable staff, and served with a sly side of clever kitsch." Universal Orlando's top table service spot, as determined by our panelists, is Mythos. Its overall score topped the second-place finisher, Mama Della's, by a considerable margin. Located in the Lost Continent section of Islands of Adventure, the restaurant features striking and whimsical architecture based on the Greek gods. It appears to have been carved out of a mountainside and its cave-like interior makes for a fun and inspired setting. The menu is wildly eclectic with dishes ranging from pad thai to risotto to wild mushroom meatloaf. The prices are surprisingly low considering the caliber of the food and the unique environment. Mythos has long been a highlight for my visits to the resort and has been a favorite of park fans since it debuted along with Islands of Adventure. Unfortunately, the overall presentation and level of food are not quite as good as when it first opened. It's still considerably better than most in-park restaurants, and the atmosphere is still inspiring. It's just a shame that the food hasn't maintained its initial impressive level. I'm surprised our judges chose Mythos as Universal's top restaurant. I still think it's good, but wouldn't personally rank it number one. If it's great food you seek, I'd advise you to consider some of the other restaurants on the list. But if you want a truly unique atmosphere and a fun break during your day at Islands of Adventure, by all means, book a reservation. Dan Hatfield, owner and editor of OrlandoInformer.com, has a tip for Mythos patrons: "When you're done dining, step out back for some of the most beautiful views you can find of Islands of Adventure -- and keep your ears open for the troll under the bridge."